Accurate pre-operative staging of cervical carcinoma is crucial in determining appropriate management. Stage IB1 encompasses clinically visible tumours <4cm, confined to cervix. These tumours are amenable to radical surgical management. 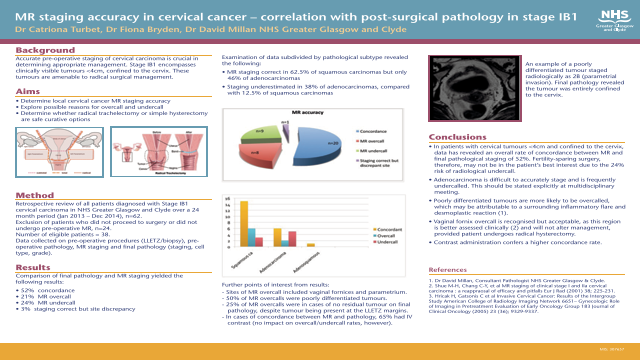 Retrospective review of all patients diagnosed with Stage IB1 cervical carcinoma in NHS Greater Glasgow and Clyde over a 24 month period (Jan 2013–Dec 2014), n=38. Data collected on pre-operative procedures/pathology, MR staging and final pathology. Concordance 52%, MR overcall 21%, MR undercall 24%, staging correct but site discrepancy 3%. Sites of MR overcall included vaginal fornices and parametrium. 50% of MR overcalls were poorly differentiated. 25% of MR overcalls were in cases of no residual tumour on final pathology, despite being tumour present at LLETZ margins. In cases of concordance between MR and pathology, 65% had IV contrast (no impact on overcall/undercall rates, however). Overall concordance rate of 52%. Adenocarcinoma is difficult to accurately stage and is frequently undercalled. Poorly differentiated tumours are more likely to be overcalled, which may be attributable to a surrounding inflammatory flare and desmoplastic reaction(1). Vaginal fornix overcall is recognised but acceptable, as this region is better assessed clinically(2) and will not alter management. Contrast administration confers a higher concordance rate. Summary: Please see abstractReferences: 1. Dr David Millan, Consultant Pathologist NHS GG&C.